Fantasy writing ideas and inspiration are everywhere -- until you want them. You think of an alien adventure story starter when a falling star arcs through the sky. Or, you see a community of fairies in your mind’s eye when the crocuses emerge earlier than usual, and happen to encircle a ring of toadstools. But then once with paper and pen in hand, or sitting in front of a keyboard -- the ideas vanish like dragons sprinkled with a wizard’s invisibility dust. 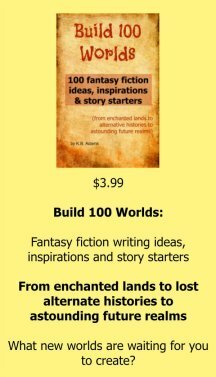 Or, there is the $3.99 ebook, Build 100 Worlds: 100 fantasy fiction writing ideas, inspirations and story starters (From enchanted lands to lost alternate histories to astounding future realms). Here, you can indulge in more elaborate story starters and templates already written for you. When you read enough of these, it’s as though a magic passageway in the creative brain opens up. Either you embellish one of the chosen fantasy writing ideas in that book with your new flow of fantasy fiction inspiration, or the story starters kick-start the way in your mind to a previously buried fantasy writing idea of your own. - Get several blank pieces of paper without lines, and an easy-flowing pen. - Continue this until you have at least 20 circles. You are entering the depths of your brain by doing this. - Do the same process for this new central word/phrase. - Once there are 20 or so on that page. Repeat one more time. At this point, some people now have access to vast arenas of new worlds, characters and plots. Other people just love how the practice feels so much they don’t want to stop, and you can certainly keep going. Some people see it as building new roadways to new ways of thinking and say that more ideas seem to start showing up even later in the day or the next day after practicing. - Final task: Close eyes and point again, but do it three times. Once on the first page again, once on the second, and once on the third page again. If you land on ones you chose before, choose the next closest one instead. Out in the real world, fantasy writing ideas can sometimes be sparked when taking walks and noticing how woodlands and crevices and the spaces between boulders could be hiding places for fantasy fiction creatures. Creative fantasy writing prompts can also be triggered when trying to solve actual mild problems. What form of magic, sci-fi technology, or friendly wizard could appear to make it all better? Ideas for creative fantasy worlds, or for writing fantasy fiction novels including alternate histories can even be found when reading scientific magazines. 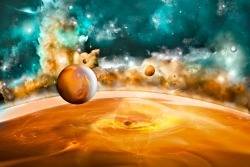 Go to your public library and look through the latest editions, noting how new life forms on earth have been recently found, and what new discoveries out in the distant galaxy have just been reported. One great group activity for a fantasy fiction writing gathering is for the writers to contribute images, written phrases on small pieces of paper, or even small actual objects that depict magic wands, distant planets, ancient candlelit castles, and so forth. Add them to a bag or box. Draw three of them out, then brainstorm together on a fantasy fiction story starter, fictional fantasy world, or opening sentence that includes all three phrases or images/items. 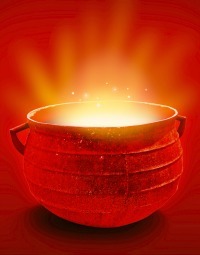 Then, each member of the writing group takes the fantasy story writing from there, sharing their creations after a given amount of writing time has elapsed.